Rodman was mentored by Henry Kissinger and worked in the State Department or Defense Department or in the White House for several Republican presidents before ending up at the liberal-ish Brookings Institution. He examines how presidents lead in foreign policy: how they choose what kind of person they want to head State or Defense (or as national security adviser) and what this says about their leadership abilities or failures; how they encourage or discourage consensus or disagreement; and how their personalities and interests affect foreign policy decision-making. Carter specifically wanted different types to head up his foreign policy apparatus (Zbigniew Brzezinski, Cyrus Vance) so that he would be presented with a variety of options (a lack of consensus, really) and could choose what he considered the best. He was haunted by how powerful Kissinger had been in the cabinets of Nixon and Ford and wanted to make sure he, the president, always made policy. Reagan had foreign policy successes in areas where he had a lot of interest (the Soviet Union) but had failures in areas which bored him (Lebanon). Clinton had very little interest in foreign policy and picked a weak head of State (Warren Christopher), and his decision-making meandered. George W. Bush put too much emphasis on getting bureaucratic consensus and, as a graduate of Harvard Business School, was too wedded to the president-as-CEO management model. Rodman argues that it is always a mistake for a president to pick a weak cabinet head or national security adviser. There are risks in picking strong personalities for a cabinet, but if a president has some foreign policy expertise or at least interest, or has a commanding management style, the risks that accompany being surrounded by other strong advisers are lessened.This was an interesting read. I will probably come back to it at some point after reading other contemporary points of view. Rodman has a clear Republican bias (Clinton and Carter come off worst), but his insights are valuable. The author was the assistant secretary of defense for international security affairs in the first several years of the George W. Bush administration. This book is by far the fairest, most even handed explanation of what went on in the Bush administration in international affairs among those insider accounts that I have read. It is, however, much more than that. Rodman began his public service as an aide to Henry Kissinger. 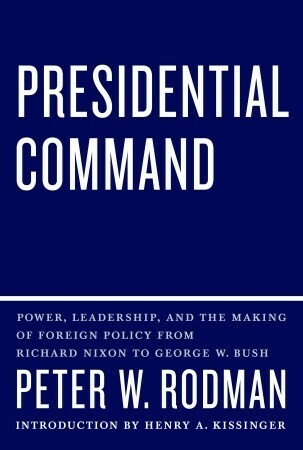 He analyzes the ways in which the modern presidents (Richard Nixon through George W. Bush) have organized their administrations and conducted themselves so that their decisions in foreign policy are carried out in the way that they intend them to be. It requires a president who is constantly engaged in the process and strong secretary of state. The president wants a secretary of state who will present options but when a decision is made act as his representative to the department rather than the department's representative to the president. Rodman devotes one chapter to each president and his administration. He finds the elder George Bush the most skilled at bending the bureaucracy to his purposes, although because he lacked "the vision thing" the public and possibly historians will never quite give him his due. He argues that Bill Clinton was fundamentally uninterested in foreign affairs during his first term and fumbled many things as a consequence but grew into the job in his second term. Sadly, the author died before the book appeared. He left, however, a legacy of even-handed commentary on a very important issue. Must read for understanding U.S. foreign policy decision-making works. It comes from a clearly biased place, however. Five stars for the window into this world, not as an endorsement of the recommendations. A very interesting insider's look at Presidential management styles and designs, largely through the lens of the National Security Council and the federal bureaucracy - State and Defense, most particularly. Rodman looks at administrations in some depth from Nixon through Bush 43 (and briefly but fascinatingly dealing with Truman through LBJ), their organizational strengths and weaknesses, personalities, Presidential characteristics and individual strengths and weaknesses to explain and illustrate successes and failures. All Presidents have difficulty compelling the standing bureaucracies to take guidance from the White House, follow White House policies, much less implement them. Rodman deftly points out reasons why, and sometimes why not. An interesting inside politics narrative from the viewpoint of one who was inside during four administrations, and had a pretty keen eye into the others.